Plans to breath new life into the site of an arson-hit former social club in Connah’s Quay look set to get the go-ahead. The former Albion social club next to St Mark’s church has been plagued by issues in recent years, including a deliberate fire in August last year. There have also been reports of anti-social behaviour and fly-tipping, including 30 car tyres which were dumped outside the property in 2016. 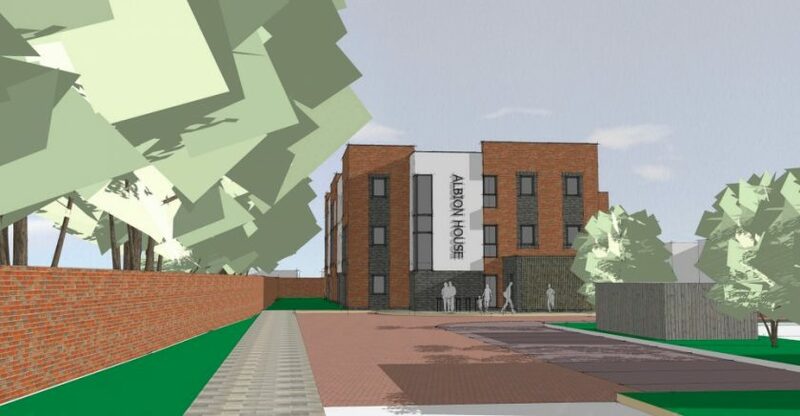 Plans were submitted in June by Pennaf Housing Group in partnership with Anwyl Construction to demolish the old building and create 30 affordable apartments for people aged over 55. They now look set to be approved, subject to a number of conditions, when Flintshire Council planning committee meet next week. Thirteen objection letters were sent to the council during a period of consultation, they include concerns over the number of parking spaces, the need for pensioners bungalows, the height of the building and pedestrian safety due to the increased traffic. Connah’s Quay Town Council said it was concerned the development overlooked neighbouring properties. Conditional planning permission is recommended to be granted subject to the applicant entering into a Section 106 agreement to provide a payment of £8,600 for a scheme to upgrade the eastbound bus stop facility at The Swan. An application to build 33 apartments at the site of the club was approved in 2016, but the company behind the previous scheme went into liquidation. Unlike the previous application, it’s proposed that the new three-storey apartment block will have a flat roof to fit in with the surrounding area. “The proposed scheme would create a form of development both in layout and design terms which would lead to an overall betterment of the site and improve the residential amenity of existing properties.